Simple to manufacture and easy to assemble, the US Navy Quonset hut is an easily recognizable architectural form, synonymous with American ingenuity and industry. The building was designed in 1941, as President Franklin D. Roosevelt had the United States preparing for the possibility of war. The Navy had approached the George A. Fuller Company to design a prefabricated, portable structure that could be easily and economically produced and shipped to military outposts. The Navy had instructed Brandenberger, and his team of engineers, to comply with only two conditions. First, the new huts had to be arch-shaped, for strength and deflection of shell fragments, and second, the structure must be of simple form (open to serve a variety of purposes), with the ability to for it to be quickly assembled by untrained personnel. Brandenberger's team was directed to use, as precedent, the Nissen Hut (which itself was loosely based on the Iroquois longhouse), developed by British Major Peter Nissen during WWI. The open interior was meant to provide optimal flexibility, being used for offices, barracks and sleeping quarters. 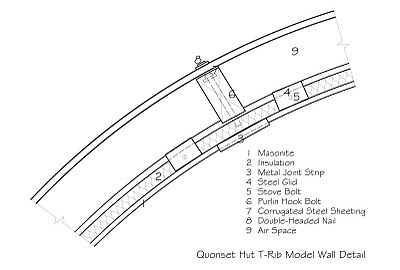 The original T-Rib Quonset Hut followed Nissen's designs very closely, both having 16 ft diameters with identical steel arched frames. The principle difference was within the wall systems, as when the team of engineers first analyzed the Nissen Hut, a common complaint was the lack of proper insulation which left the huts too cold in the winter and too hot in the summer. To overcome this design flaw, Brandenberger's team proposed a thin, lightweight pressed-wood lining of 3/16-inch Masonite held to the rib flange with a attachment clip, and then covered with a one-inch-thick layer of paper insulation. This insulating system was then covered with an exterior of corrugated metal panels mounted on wood purlins. The Nissen had a more complicated corrugated metal paneling system (both interior and exterior), which relied solely on the air cavity between panels for its thermal barrier . 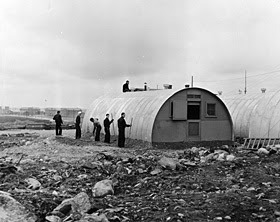 Thus, the T-Rib Quonset Huts provided the US troops with a greater level of comfort. 3 months after initiating the design, the US Military now possessed a new demountable structure that could be shipped in 12 crates and put up in one day by ten labourers who required no special training or skills. 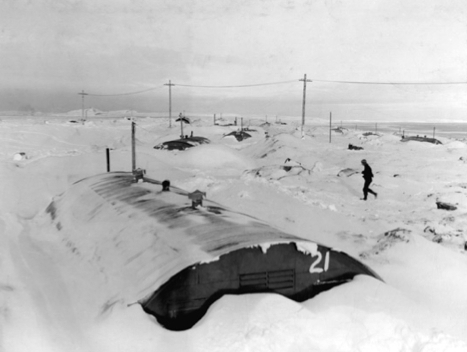 At the end of 1941, the Quonset Huts were given a field test that proved their success in winter use, as 8 200 T-Rib Quonset huts were shipped to Iceland. According to George A. Fuller Co.: "A night gale of hurricane proportion that wrecked shipping in the harbour.... ripped the covering off of many British Nissen huts, left the Quonset huts practically undamaged". "World In Conflict: WWII Memories." East Riding of Yorkshire Council, accessed December 5, 2012. "The Huts." Quonset.org, accessed December 1, 2012. http://www.quonsethuts.org/huts/index.htm.